Women Only Hear Properly When Gossiping Or Eavesdropping… I Knew It!.. Women only really hear properly when they are gossiping or eavesdropping on other people’s conversations, according to new research. 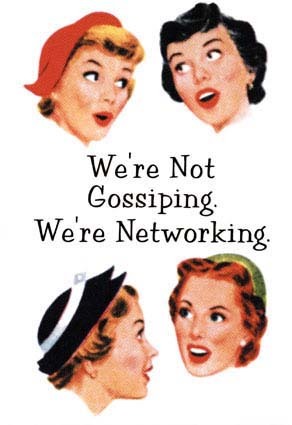 More than two thirds of women admitted that a gossip with friends is the only time they are properly listening to what is being said. The same percentage think they hear most intently when they are trying to eavesdrop on an argument taking place nearby. Only half of men said they only hear properly when gossiping, while four in 10 admitted to listening closely to other people’s conversations. The poll of 2,000 people also found that more than one in five men reckon they always listen carefully to every word, and while less than one in five of women said the same. Ladies are also most likely to switch off when listening to their work colleagues, with the average woman catching what they say just 64 per cent of the time. Just two thirds of what their boss says gets picked up, while women admitted they only really hear 70 per cent of the conversations they have with their partner. But when it comes to talking to their best friend, women give their full attention to more than three quarters of what is spoken. Researchers also revealed that 84 per cent of Brits think they are a good listener, with 20 per cent saying they listen to every word. And 58 per cent think speaking face-to-face is the best form of communication. Two thirds of women admitted they had never had a hearing test – compared to 55 per cent of men. And almost half of people admit they sometimes struggle to hear what other people are saying. Wendy Davies, Audiologist at Siemens Hearing Instruments which carried out the research, said: “The first sign of hearing loss is constantly asking ‘pardon’ or turning up the TV really loud. “If you think this is you, a visit to the GP is on the cards to rule out medical problems and refer you for a test. “You don’t have to be old to lose your hearing – loud clubbing and high volume on your MP3 can damage ears, so it’s important to have regular tests.